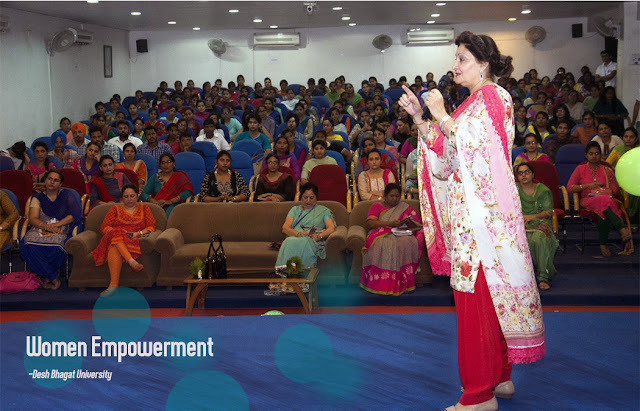 Desh Bhagat University, in best university in Punjab and top universities in India, organised a lecture on Women’s Empowerment on Wednesday, in which students and faculty members of different university faculties participated. 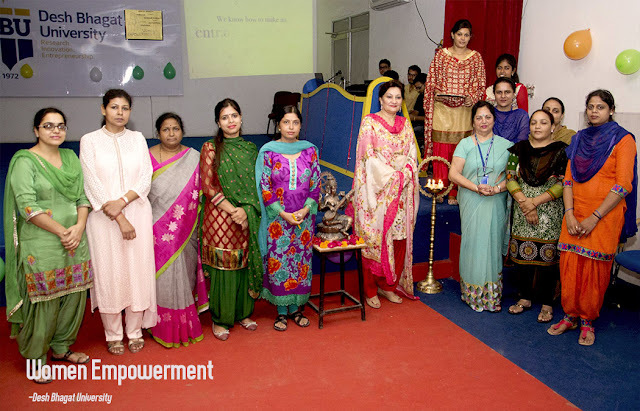 University Pro Chancellor Ms. Tajinder Kaur was the chief guest on this occasion. In her very impressive speech she discussed about Condition and Direction of Women in today's world. Speaking on the occasion, she said that the thinking of society about women has changed a lot and they are much stronger than before but still there are several miles to go for their full empowerment. She said that today woman has got that position in the society for which she had been struggling for centuries. But even then she should continue to fight for her rights and not sit still. She regretted that evil of female foeticide is prevalent even today. So the girls should get education and become aware of their rights, so that they can become self-reliant and make their contribution to the development of the country. Speaking on the occasion Director Faculty of Education Dr. Surjeet Patheja said that women are contributing a lot in the progress of society and the country and it’s essential for the society to give full respect to the women and every kind of oppression must be stopped against them. Dr. Ramandeep Dhilon said that we can't imagine a world without women and we must show maximum regard to them. On this occasion students organised a Minni Rally for Social Awareness. The motto of the rally was to create awareness regarding crime against women, female foeticide, use of drugs and social evils. A large number of students participated in it. University Chancellor Dr. Zora Singh and Vice Chancellor Dr. Virinder Singh appreciated the whole team of DBU who has done their best to make this programme successful.